TSPSC TS Departmental Tests Syllabus, Books, Exam pattern for EOT 141, GOT 88 & 97: TSPSC Departmental Tests Exams Syllabus, Books, Study Material Bits, TS Departmetnal Tests Exam Pattern, GOT 88, 97 Bits, EOT 141 Bits, TSPSC TSPSC GOT 88 & 97 Department Test Syllabus, Useful Books, Material, D.T. for Gazetted Officers of Education department (88 97), A.T. for Gazetted Officers of the Education Department(141). 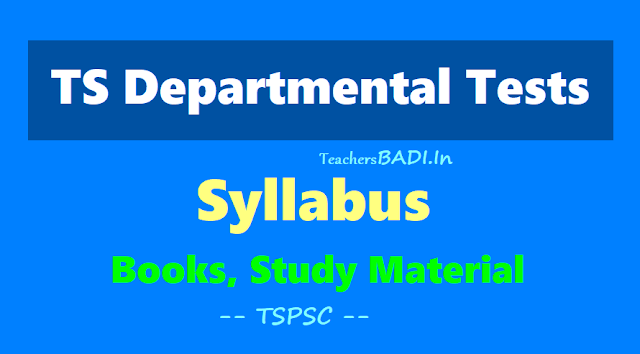 TS Departmental tests model question papers, TSPSC Departmental tests syllabus, TSPSC Departmental Tests hall tickets, TSPSC Departmental Tests Results. Departmental tests previous papers, TS Departmental Tests EOT GOT Exam Objective type Material, TS Departmental Tests Material Bit Bank Questions. TS Departmental Tests (E.O.T and G.O.T Tests): Who are attending Departmental Tests G.O test and E.O. exam Material in Bits type below links are very useful. How to calculate Pension formulae and rules. Who sanction Allowances for Employees, Treasury forms codes, Surrender leave formule, How to maintain Leave rules, Service rules, DDO Sanction bills and Leaves etc. TSPSC conducts TS Departmental Tests in every year for TS Teachers and TS Employees. Department Tests are mandatory for award of Certain AAS Scales and for Promotions. Department Test for the Gazetted Officers of Education Department(GOT) has two papers. This GOT Test is intended for Gazetted Officers Post of Edn Dept. As the Least level Gazetted Officer Post in Edn Dept is Gz Head Master, the Syllabus of GOT (Code 88 & 97) is also related to the duties of Gz HM. Passing in GOT Exam is mandatory for award of 24 Years AAS Scale to SGTs and 12 Years AAS scale to School Assistants. The EOT is intended for Executive Officer Posts. The Syllabus of EOT is also inline with the duties related to the Executive Officer Posts. The EOT Test is also mandatory for Gz Head Masters Post in Education Department. Hence all the Teachers who are in award of Gz HM Post or Scale should qualify the EOT Paper 141. The Syllabus of EOT mainly deals with Financial, Treasury, Budget Matters. The Detailed Syllabus, Exam Pattern and List of Books allowed for GOT Test, EOT Test as released by TSPSC is given below. The EOT is to be conducted in Objective mode for 100 Marks. Candidates should note that they can buy Bare Act of Govt Publishers or they will be permitted to use private publishers books of compiled bare acts. They cannot use Guides/Model Question Papers. 4. An Introduction to Indian Govt Accounts and Audit Chapter I, Part-B of Chapter-II, Chapters 10. 13, 15, 16, 17, 24, 25, 27 and 28. 5. The Constitution of India, 1950 Articles 148 to 151, 202 to 207, 264 to 293 and 308 to 314. 6. The Andhra Pradesh Pension Code. 5. Chapter-V Establishments, Claims of Government Servants and Recoveries from them, Deductions from Pay Bills of Government Servants. 9. Chapter-XII Responsibilities for Loses of Public Moneys or Properties i) Security Deposits ii) Loses. 7. Chapter-VIII Classification of Capital Expenditure. 2. Chapter-II Comptroller and Auditor General of India, Duties and Powers regarding Audit, Audit Reports. 3. Chapter-X Other Accounting Organization and Internal Check, Central Civil Ministries /Departments, Defense, Budget Estimates etc..
7. Chapter-XVII Economy Efficiency and Effectiveness of Audit, Meaning of Three Es, Planning the Review etc.. The AP Pension Code and Revised Pension Rules up to date is the Important syllabus for EOT Exam. Candidates should be through all the Rules and GOs..Here we are giving some of the topics.. We will discuss in detailed in a separate post. 1. Counting of Service for PENSION in different aspects. 4. Retirement on attaining the age of superannuation, retirement on completion of 20 years, retirement on completion of 33 years. The GOT is to be conducted in Objective mode for 100 Marks. 1. Rules relating to Elementary Schools. 5. Instructions to Local authorities and Inspecting Officers of the Education Department in connection with Universal Free and Compulsory Primary Education in Andhra Pradesh. 1. The Andhra Pradesh Civil Services (Classification, Control and appeal) and the Hyderabad (Classification, Control and appeal) Rules. 2. The Andhra Pradesh Panchayat Samithis and Zilla Parishads Act 1959, and rules issued thereafter. 3. The New SSC (10th Class) Scheme issued in GO.Ms.No.63 Edn dated 16th Jan 1969 (Vide GO.554 Dated 9th Aug 1974). 4. Special Rules for Educational Service and Special Rules for Educational Sub-Ordinate Service. Note: Candidates are required to be conversant with such amendments to Acts and Rules as have been issued or published prior to six months to the date of examination. Candidates should be through with the Scheme of Secondary School Certificate (X class) Public Examination issued vide GO.Ms.No.63 Education (W-2) Dated 16th Jan 1969. 7. Date and Nature of Public Examination..
2. Chapter-II Constitution, Incorporaton, Composition, Powers, Functions etc of Mandal Praja Parishads. 3. Chapter-III Constitution, Incorporaton, Composition, Powers, Functions etc of Zilla Praja Parishads. 6. The Andhra Pradesh Civil Services (Classification, Control and appeal) Rules..
PART-II CLASSIFICATION: Classification of Services, State Services. Subordinate Services. ప్రస్తుతం జరుగుతున్న ఆన్-లైన్ పద్దతి ఆధారంగా Chapters Wise గా ముఖ్యమైన అంశాలతో తయారు చేయబడిన Latest Updated మెటీరియల్స్ ప్రింట్ తీసుకోవడానికి వీలుగా ఉన్నవి.